One of the challenges we hear most frequently from prospective readers is that they don’t have time to sift through the abundance of news coverage – and that they’re hungry for a source that cuts through the noise, delivering trustworthy information when they need to know it. Subscribers value the Financial Times for just that: clear and concise reporting that keeps them informed when time is limited. When there’s only a few minutes for a skim of top industry and global headlines, readers trust the FT to provide an accurate and reliable account of key events. A side-by-side comparison of selected coverage by a third-party consultancy found that readers could get a clearer understanding of a news event from the FT over competing publications within a shorter amount of reading time. Our reporters cover the most pertinent facts at the beginning of articles, ensuring that even in their busiest moments subscribers come away well-informed. And with an editorial network of 600 journalists worldwide, the FT provides relevant context to breaking developments, saving readers the time of flipping back to previous reporting. With an FT Group Subscription, our US readers are able to stay on top of what’s happening in their industry globally without unnecessary reading time, leaving them freer to focus on actioning. Interested in a complimentary trial for you and your team? Amid information overload, knowledge managers at the commercial law firm Nabarro recognized that they needed a clear and comprehensive news source. “Lawyers work in a high pressure environment and they’re already overloaded with information. We needed a way to streamline the news and keep them informed on the most important and relevant matters,” said Mark Collins, Head of Knowledge at Nabarro. The team identified the FT as the solution for two key reasons: the quality of business information and the ease of access through a firm-wide corporate license. The outcome? According to an internal survey, 87% of users said that the FT saved them time, helping them find relevant information quickly and easily. Further, 69% of respondents said they had been in situations where they were relieved to have access to FT.com. Speaking of tables and charts: Recognizing that visuals often contain the essence of a story, the FT has launched a searchable, chronological page of all the graphics published on FT.com (complete with links to the articles that contain them). Access to this new hub is included with an FT Group Subscription. Contact us today to learn more. As a major global institution, BNP Paribas faced a key challenge in obtaining a global view of developments in business and finance – while ensuring only trusted and credible sources of information were used to drive the investment decisions made by its professionals. And, this solution had to fit within the bank’s in-house information portal. Once selected, the FT worked closely with the project team at BNP Paribas to closely integrate content with user workflows and supporting technology, ensuring easy access for staff. The outcome? While each department utilizes the FT differently to fulfill their unique needs, the timesaving benefit is acknowledged firm-wide. “When you consider the huge volume of documents available, the FT is a quick way to understand what’s really happening and we believe that the FT gives us a competitive edge,” Bernardini concluded. As part of an FT Group Subscription, organizations can integrate FT Single Sign On (SSO) for seamless access to FT.com and FT apps using a centralized login system, allowing readers to get onto FT more quickly and with the highest level of account security. Since launching FT SSO in 2014, we’ve heard positive feedback from over 70 clients who are utilizing the solution. 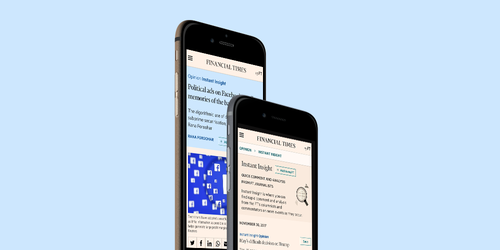 To review, the FT delivers subscribers the right information at the right time – saving them precious time. Want to learn more?